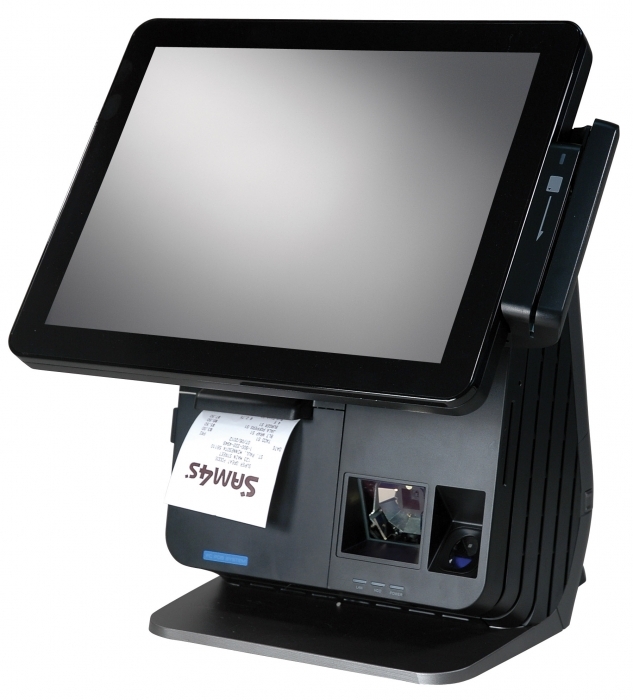 A fully integrated POS terminal, SPT-7500 – true flat display model, includes an integrated touch screen, card reader, power supply, thermal printer, and can be configured with an available integrated barcode scanner and fingerprint reader. With a footprint only 10½" wide by 12" deep the SPT-7500 is ideal for POS applications where counter space is at a premium such as ticket offices and concessions. The compact integrated thermal receipt printer incorporates user friendly features such as anti-jam technology and drop-in paper loading. • 220mm per second print speed. • Stores/prints user defined graphic logos, coupons or advertising messages. • Printer supports both USB and serial interfaces. • Connects to an internal USB port or to COM3 port with included cables. The SAM4s SPT-7000 Series can incorporate a Scantech ID® integrated scanner with 24 scan lines in 6 scan directions and 2000 scans per second. The Scantech ID® scanner provides an outstanding scan performance and makes it very easy to scan all common type 1D barcodes, including GS1 DataBar, independent of a code’s orientation. • Features Scantech ID STAR ® reconstruction software for reading of fragmented and damaged barcodes. • Extremely high first scan rate. • Auto-Sense function, which saves power and extends life. • Most compact omni-directional laser barcode scan engine in its class. • Connects to a dedicated internal USB port. The self-contained U.are.U 4500 Fingerprint Reader Module from Digital Persona ® optically scans the fi ngerprint when the user touches the glowing window. Optical technology provides the highest quality fingerprint scans and reliability. • Blue LED (in idle mode). • Latent print rejection and counterfeit finger rejection. • Works well with dry, moist or rough fingerprints. Build a strong relationship with your customer by clearly displaying each item as it is registered. 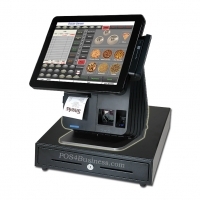 Customers can easily monitor the transaction as it is entered, clearly viewing the price of each item. The SAM4s display provides two lines with 20 characters per line, so that both the price and the description of the item are displayed simultaneously. With each transaction closely monitored by the customer, the opportunity for employee theft and fraud is limited. • VFD 2 lines of 20 columns. • 9.15mm high x 5.45mm wide character size. • User-defined and international character set standard. • Supports all popular emulations. • Connects to a dedicated internal powered serial port.